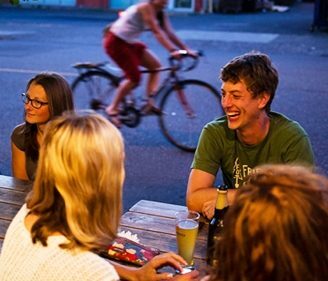 Often called America’s bike capital, Portland is the largest U.S. city to attain platinum status by the American League of Bicyclists. Only here does a publicly visible “bike barometer” run daily into the thousands. Well-marked bike lanes keep cycling routes safe and fun. Ample staple-shaped bike racks outside our food, arts and shopping hot spots make it easy to hop off and lock up, experiencing the City of Roses with none of the hassles of city driving. A good place to start and finish a downtown slow roll is Tom McCall Waterfront Park. Voted one of America’s greatest public spaces by the American Planning Association, the park is named after the Oregon governor who pledged urban beautification, a throwback to the turn-of-the-century City Beautiful movement, and a national model for the pedestrian pleasures that can result with freeway removal (the Harbor Drive freeway was taken out in 1974). Follow the flow of the Willamette River north along the Waterfront Park Trail. If you’re here on a weekend between March and December, check out local artisan wares at the Portland Saturday Market, the city’s largest outdoor arts and crafts market. 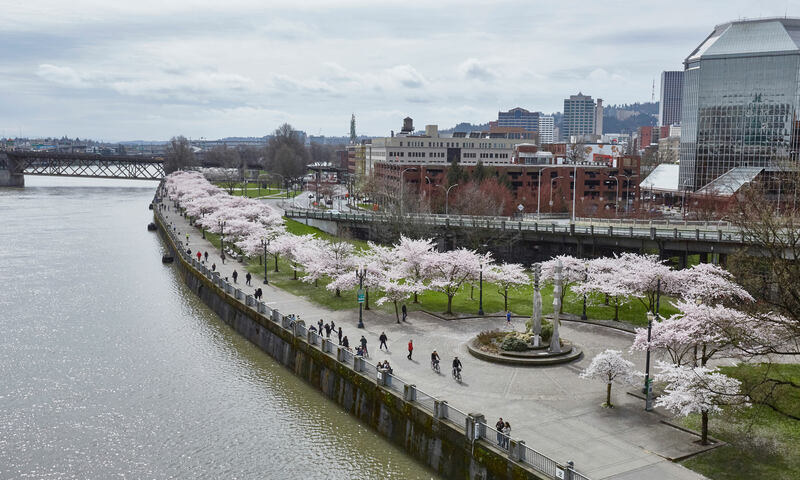 Past the Burnside Bridge, you’ll notice a mix of bronze reliefs, stone engravings and curated landscapes — including our famed cherry blossom trees in spring — that collectively tell a century-long story of Japanese American life at the Japanese American Historical Plaza. From the Plaza head west on Couch Street, before turning north on 4th Street into Chinatown. You’ll know you’re here by the red-painted lampposts. Consider visiting the serene Lan Su Chinese Garden, a harmonic blend of art, architecture and landscape design whose curators claim will transport you to “another era in a faraway world.” Here the Tower of Cosmic Reflections offers tea prepared by the Tao of Tea, a renowned fair-trade certified company whose old-style serving methods include pure leaf teas in various vessels. Now mellowed, take Flanders west to the North Park Blocks. Enjoy the shade of the cathedral-like elm trees lining the blocks. You’re now in the Pearl District, so named for the pearls of art made in formerly crusty factories and industrial-era buildings. The alphabetical street names on your map tell another story — do Flanders, Kearny or Lovejoy ring any bells? For Simpsons fans, these streets are the namesakes for characters created by Portland native Matt Groening. Hungry yet? Tie your lunch break into an appreciation of sustainable architecture, cruising up 9th Street to the Ecotrust Building. The first U.S. redevelopment building to receive gold-rated LEED Certification, here you’ll find a mix of private and public businesses that balance profit with social and environmental responsibility. Solar panels help heat the ovens of Laughing Planet and Hot Lips Pizza; an onsite rain catchment system reuses 95 percent of the building’s stormwater. 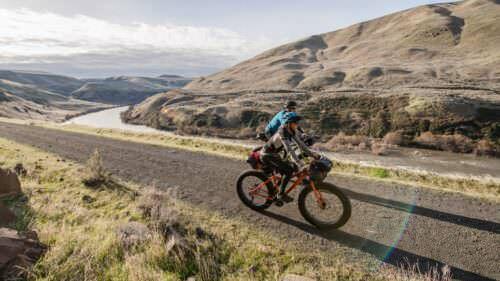 The building also hosts a Patagonia Store, whose Footprint Project documents their transparent supply chain, making them a trendsetter for companies trying to reduce adverse social and environmental impacts. After lunch swing by Tanner Springs Park, whose urban-wetland design includes repurposed steel beams made into sculpture, as well as replanted native grown trees salvaged from outside the city. 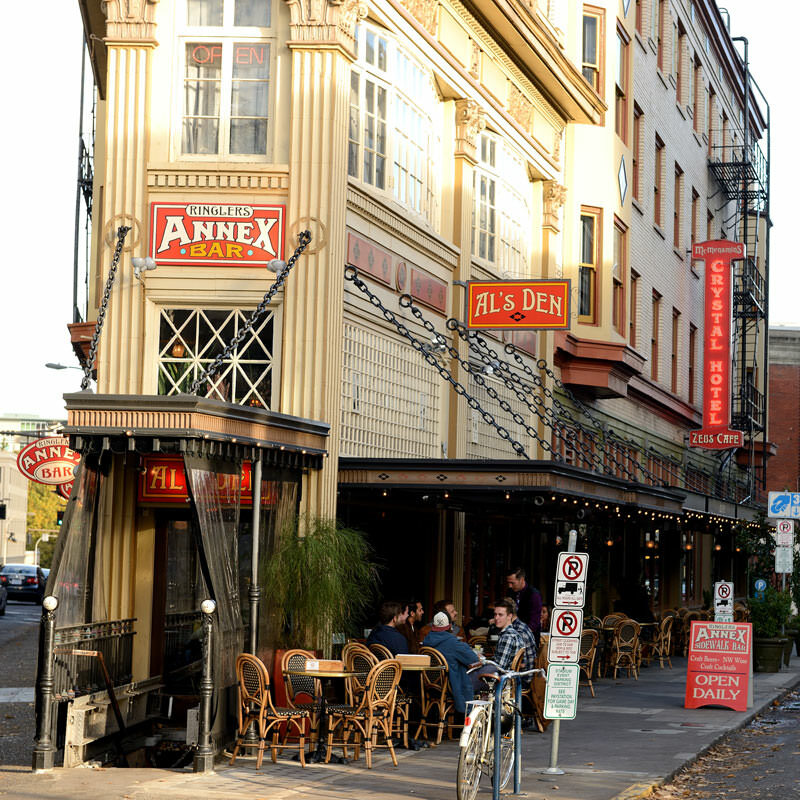 If you’re thirsty, consider stopping at the nearby Bridgetown Brewpub, Portland’s oldest brewery, or shooting down to McMenamins Crystal Ballroom, a 100-plus-year-old city staple that hosts eclectic shows nightly, and ballroom dance lessons on Sunday. For the last leg of the ride, head southeast on Stark, towards Broadway. Stop by Portland State University, whose campus is nestled among the tall trees of the South Park Blocks. On weekends the blocks host the largest farmers market in town, punctuated by the nationally landmarked Benson House and a streaming four-headed water fountain (known as Benson Bubblers, reportedly installed by lumber baron Simon Benson to keep his workers out of saloons at lunchtime). If you’re still feeling energized, head east via Madison towards the Hawthorne Bridge. Once atop the bridge pull over to take in views, with (on a clear day) Mount Hood to the east, and the recently-opened Tilikum Crossing to the south— named after the Chinook word for tribe or people, Tilikum Crossing is a pedestrian suspension bridge shared with light rail, bus and emergency vehicles: no cars or trucks are allowed use. 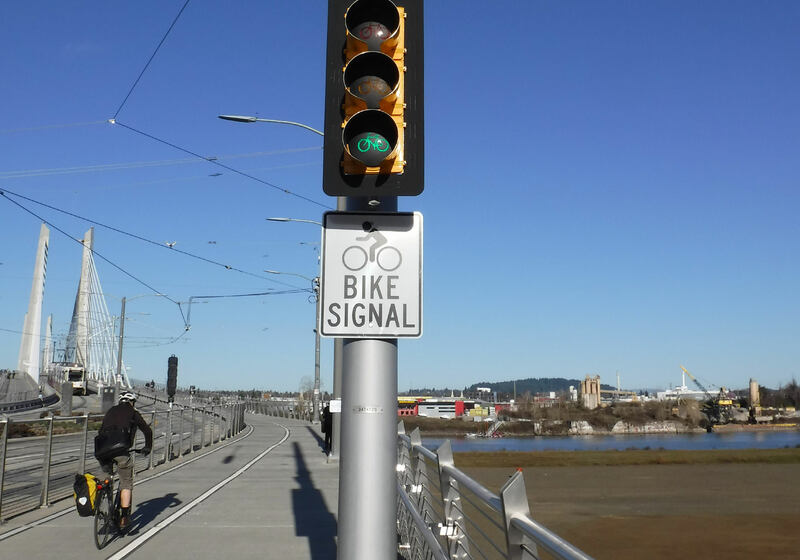 The “bike barometer” at Tilikum Bridge often runs daily into the thousands. 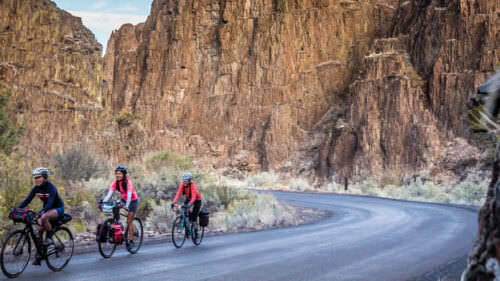 To wrap up your ride, you’ll push the last mile and a half north up the Eastbank Esplanade, which includes the longest floating walkway in the United States. Under the Burnside Bridge you’ll see the concrete hips and bowls of the popular Burnside Skatepark. Cross the double-decker Steel Bridge, one of the world’s most multi-modal, including a vehicle road, freight and light rail tracks and a pedestrian-bike path. Back downtown, hop off, unstrap your helmet and take a well-deserved break: you’ve earned it! Note: This was created to give folks unfamiliar with urban cycling an introduction to the city. I stuck to roads that had dedicated bike lanes or were bike-friendly. 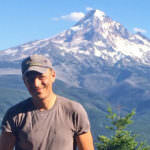 Paul Lask teaches writing at Portland State University, where he is also a faculty fellow with the Institute for Sustainable Solutions. During the summer he is a kayak guide. He and his wife live in Southeast Portland with a number of succulents, ferns, and other lively houseplants.